My buddy Maxx was the best dog in the world. He was a chihuahua mix, in a beautiful yellow color. He hated it when you made a kissing sound around him, loved playing with our other dogs, jumping from couch to couch trying to catch them, and his best friend was a plastic goose that he always slept. He was great. Then, he came down with parvo. to turn our heads because his chewing is so loud, you can hear him eat in the other room, or will he playfully bite us because we are acting like we are going to kiss him. Never again will he beg for food, or bark when he hears a dog outside barking. Maxx was a big dog in a tiny dog’s body. It kills me what happened to him. No dog deserves that. If you have a dog you’d like to remember, contact us, and we’ll post your story. I’m sorry to hear about your puppy. I just lost my baby on Sept 30 09 to parvo. She was a tiny white t-cup chihuahua. I loved her so much and I felt as though she was my child. I carried her to the vet as soon as symptoms started but she weighed so little the parvo took over her body after 5 days. I feel for anyone who watches their pet go through such a terrible disease. My heart goes out to all of you. Loosing a pet is a very tragic event. We lost our beloved daschund in April 09, she had been going donwhill for quite sometime – she was 14 years 3 months 8 days old. That leaves a huge hole in your heart & because of that, are afraid to get another. Was looking at a dog which is not yet ready for adoption because he has/ had / has Parvo & that’s what brought me to this site. As they say, time heals. Bless you all for your kind hearts. I just took my 7 1/2 week old chihuahua to the vet. The doctors suspects parvo. I cried when i read what happened to your baby. I pray to God that He will heal my baby Milo. I have him on antibiotics, pepto bismo and pedialyte. Please keep him in your prayers. 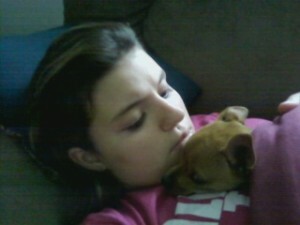 IM sorry to hear about your puppy, the past 2 days my puppy boxer has been showing sign’s of parvo. he has already lost alot of weight. its such a terrible feeling to see them like this. i hope we cought it in time i cant stop crying. I am sorry to hear about all your tragic stories relating to your dogs.I just lost my chihuahua Maeva on 12/3/2009.I can’t seem to stop crying when I think about her.I actually had to come to the decision of putting her down for she suffered severely 2 days after noticing the changes with her weight.I wish I would’ve had another choice but could not bear seeing her in so much pain.I hate for anyone who goes through this tragedy especially when you consider your pet like one of your children like i considered mine to me.My prayers are with all of you and your pets…. So sorry to here that =< My daughter is in the animal hospital right now for maybe the same thing. I think there needs to be more education handed out on this from the vets and breeders before hand so that people know what signs to look for before such a thing happens. God bless you and your family! Its really painful to see one’s pet in terrible condition and we cant do anything except for giving supportive treatment just to make sure the condition does not become worse. I have a black Lab, named Ben, he is 7 weeks old and is infected with Parvo, he is on antibiotics and IV fluids…lets hope he gets well soon…. Our 8 month-old Boston Terrier has been showing symptoms for 3 days…we’re seeing the vet, today. He’s still eating, drinking, and full of energy, but the bloody stools and vomiting seem to be worsening. We’re hoping for negative test results. Thank you everyone for the comments! Maxx was a doll and is still in my heart! I love him so very dearly and although I have other dogs, and have had two dogs join the family since Maxx left, the pain is still the same. It hurts. And it hits close to home for anyone that has ever lost a dog. For all of you who are dealing with your dogs suffering, gatorade helps…So does knowledge, if I had known then what I know now about parvo, maybe maxx would still be here, but keep the dogs as comfortable as possible and know that the one thing that the dog wants to know is that pain is temporary. I believe that dogs can understand what you say, and they need you to be there for them, after all, look at all the times they were there for you. Good luck and my prayers are with you. I just found out that the black lab puppy I adopted from the shelter last Saturday and picked up on Monday after being spayed now has the parvo virus. I feel so sorry for the lil girl bcuz she has not had much of a life so far. Her whole life has been in a cage and I had to walk away from her today and leave her with the vet so that they could hopefully make her feel better. I thought she had a rawhide stuck in her belly – not that she had a deadly disease. She only wanted to sleep yesterday and started throwing up late last night and I decided to call the vet this morning! Thank goodness that they were able to get me in today and now they have her! Please keep your fingers crossed because I don’t want to lose my new puppy! She has been so good to me since I had lost my 9 year old dog 3 months ago to Cushings Disease! My 4 month old puppy, Dani, just died yesterday of parvo. She was just a mutt my boyfriend found for free in the newspaper, but we loved her with all we had. She was fun and loving and loved to do tricks for treats. Every time I would play with her she loved to bite at my hair and scalp. I never knew parvo was so serious until I found her yesterday and started to research the symptoms. She had been feeling ill for a few days, but I didn’t think anything of it and now I regret not taking her to the vet sooner. We always got compliments on her unique color and spots every time we went anywhere and one time we even started calling her dingo after a homeless man at the park swore she was an African Dingo. I can honestly say from this day on I will never take a small illness in a pet so casual. So sorry to read about your loss. I was on here trying to find out more about parvo and stumbled across your post. I have 2 three month old male chihuahuas in the vet hospital fighting parvo as we speak. The smallest of the two weighs only 2.4 pounds and he is the sickest. It was hard to read your post and all the comments but felt compelled to let you know how truly sorry I am for your loss and I understand where you are coming from. It has only been 24 hours since their treatment was started and I pray the good Lord above helps them through this and back home where they are loved very much. Took our little puppy to the vet today. Test was positive. We are treating at home with anti biotics and peditiate. We are also feeding him gerber lamb baby food. Will post update. i am sorry for everyones lost..i have a 11 month old chihuahua/jack russell mix and i thought she was having symptoms because she would eat alot and then play and then start hacking…so i went on to see if that is a symptom..good thing its not. me and my fiancee adopted her when she was 18 weeks old and in her record she got her shots and all for parvo..i hope that she doesnt get it! but i will pray for everyone lost! My sympathy to you all. My husband and I lost our 8 month year old puppy four days ago to what we think was Parvo. A week ago at this time she was healthy and full of energy. She starting severe vomiting on Tuesday and I took her to the vet the next morning because the vomiting did not stop. They thought it could be a foriegn object in her stomach or a stomach bug (gastritis). They did xrays and found nothing, so treated her for a stomach issue. She had no fever and was not dehydrated. They never tested her for Parvo and ruled it out because she was vaccinated and did not have a fever. That night the diarrhea started and the next day she passed away in the morning (10AM). I had called her vet that morning to insist on bringing her back since her symptoms had worsen (she could hardly walk and had lost a lot of weight)… and the vet tech here said she would have to call me back after consulting with the doctor. As her petsitter was on the phone with other vets in the area, trying to get her an appointment immediately, she stopped breathing in our home. Chest compressions were done and she was rushed to the nearest vet. They pronounced her dead and said she had Parvo..therefore telling me they had to disinfect their entire hospital and send the staff home to change cloths (also telling us we could not see her body since she was “comtaminated”). No former testing was done to confirm this diagnosis, but they strongly believed it was Parvo. This is such a tragedy and horrible story. We are trying to grieve her death, but can’t stop thinking of all the “should of could of would ofs”. She was amazing and such a smart dog! We miss her and love her so much….she was our little doodle bug!